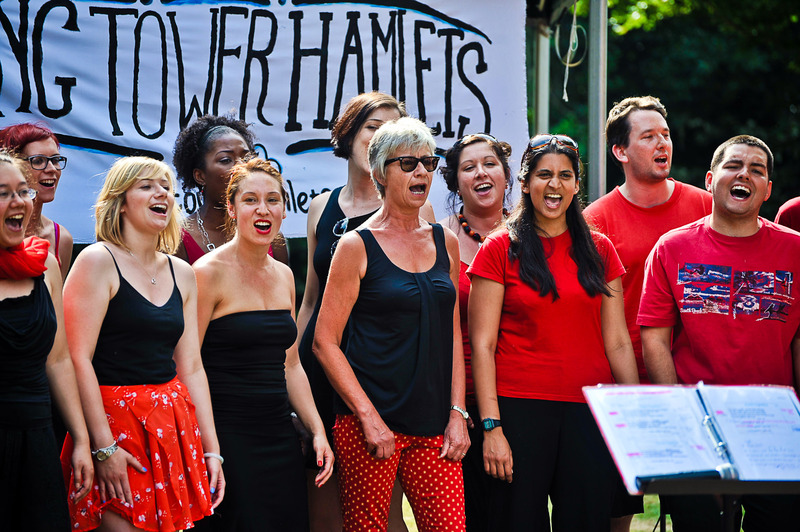 Sing Tower Hamlets is a community choir based in East London, open to all, taking place on Thursday evenings (7.30-9.30pm) at St Paul’s Shadwell. I f you love to sing, Sing Tower Hamlets is for you! The choir brings together people from various walks of life (across Tower Hamlets and beyond) to sing in a friendly and informal environment, making a joyful noise in the heart of the east end. There are no auditions, and songs are mostly taught by ear, so you don’t need to be able to read music. Whether you’re a seasoned performer or a nursery-rhyme-crooner, a karaoke king or a save-it-for-the-shower type, you are welcome — nay, encouraged — to come along! We sing a range of styles — pop, gospel, world music, soul, folk, even a good old show tune every now and then — and do lots of fun warm-ups to build your confidence and free your voice! Have a look around the site for more information on term dates, costs, and directions… also check out the blog for updates and other musings about all things singing! And finally, about me: I’m Leanne! I’ve lived and worked in East London for 10 years and set up Sing Tower Hamlets in 2013. I absolutely love this part of London and am passionate about building and celebrating community here. It was a long term dream of mine to run my own community choir*, and since moving to Tower Hamlets in 2008 and falling in love with the place, I can think of nowhere else I’d rather be doing it! (Handy really; the name wouldn’t really transfer…). When I’m not leading STH, I run school choirs, teach singing, lead songwriting and music workshops, sing and conduct with London Contemporary Voices, and make art with words and watercolours at East London Lettering. I trained as a music leader with Spitalfields Music, and am currently doing a Masters in Vocal Leadership at the Royal Academy of Music in Aarhus/Aalborg, Denmark. Do get in touch if you have any questions – I’d love to hear from you!